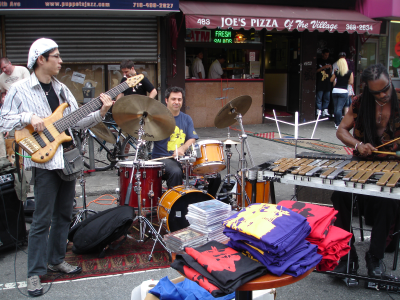 Brooklyn Living is the website for Brooklynites and visitors to discover the rich cultural roots of our city and to understand how it is changing into the middle of the 21st century. The Spring and Summer of 2017 has brought a crisis to the working people of the City of New York with the MTA. Long festering problems seemed to have bubbled up into a frothy cauldron of troubles leaving New Yorkers contemplating the viability of a living in this city. Commuting, family trips to the Zoo and the Beach, doctors appointments, every routine trip has become cause for worry. Venturing into our mass transit system has become arduous and dangerous. A typical trip involves confronting menacing, endless pan handling, religious sermons, confrontations with the mentally ill and otherwise dangerous individuals, urine human feces in stairwells and elevators, and shanty town encampments at subways stations all along the system. Added to this, the system itself is in a state of total dysfunction. Rush Hour has been effectively cancelled by the MTA several times in May and June to the cost of billions of dollars of business losses and wages. Twice, the MTA has reported that power outages in Brooklyn's Dekalb Avenue hub had forced the shutdown for over 45 minutes the entire Atlantic Avenue - Dekalb Avenue complex during apex of the morning rush hour. Both on May 7th and May 9th, 2017 the MTA reported outages by ConEd. ConEd in turn reports that there was no outage on Sunday, just a voltage dip and that on Tuesday they can't find any such equipment failure. This is not how an enterprise ready system should function. These mystery outages shut down rush hour traffic for the B,D,N,Q,R,2,3,4, and 5 trains, covering the bulk of the Borough, and affecting broadly traffic all the way to the Bronx. And yet power was up and everything lit up all about Downtown Brooklyn leaving angry commuters cynical about the durability of the system and the competency of the upper management. How is it possible that a system that has successfully run for well over one hundred years, that carried in the 40's and 50's nearly twice the traffic that it does now, that successfully negotiated two world wars, the great depression, the fiscal crisis and near bankruptcy of the 1970's, the abuse and neglect of the 1980's, 9-11, and yet seems to be succumbing to signal failures and minor power outages late into the second decade of the 21st century? How is it possible that after recently pouring billions of dollars into track work and platform improvements, to the tune of over 40 billion dollars of MTA capital debt, that the system is now incapable of its primary function which is to move trains and people in a clean, and safe manner. Commuters cynicism has been cruelly confirmed with a head-on derailment of the A train in July, the result of sloppy maintenance secondary to track work. The resulting rush hour derailment killed service uptown and in the Bronx, stranding everything above 59th street, including Harlem, Washington Heights, Ingelwood, and the Bronx, while disrupting service all along the A,C,D and B trains. "It felt like a greenhouse. It felt like we were going to suffocate,"
Obviously, even the most incompetent stewardship of any organization, if after pouring billions of dollars into a product, if it then failed to deliver on the most basic enterprise milestones, that management team would be relieved of duty and humiliated. That the stewards of the MTA, the Mayor of New York City and the Governor of New York State, face this crisis now and while both failed to purge the MTA's upper management, there passive response goes to the very heart of the problem that has been a festering sore for generations. The MTA has a disregard for its customers and no accountability. It's priorities are drawn up in well lit rooms at 2 Broadway, and 330 Madison Avenue, drumming up big plans and projects, each a line item for the "subway of the future", while unable to presently consistently move people safely. It pays off politicians with sprinkles of pet projects, and has failed on the fundamentals, to provide a safe and reliable ride, something which has been as dependable as tap water until the recent administration. The roots of the current crisis finds its way back to the 1930's and the great expansion of the New York transportation system under the guise of the New York States Parks Department and Boss Robert Moses. Anyone not familiar with this classic story of local government gone wild needs to familiarize themselves with the legend of lore of Boss Moses. From the 1930's to the 1960's, Moses cut through New Yorks legendary stalemate politics to construct all of the toll bridges which are now owned by the MTA and developed the major highways that today run through the city. Among these bridges and tunnels includes the Henry Hudson Bridge, Triborough Bridge, Queens Midtown Tunnel, The Battery Tunnel, and the Verrazzano Bridge. Additionally, he was able to cajole the city and state to foreclose on huge tracks of property to lay out the Cross Bronx Expressway, the BQE, the Belt Parkway, the Long Island Expressway, Van Wick Expressway, Grand Central and Interborough Parkways, while building Jones Beach and promoting good suburban living. Moses was capable of this astonishing growth by leveraging the toll booths income to do an end run about the Governor and the Mayor and to design and implement is projects with just a moniker of public oversite. When he ran into opposition, he largely just ran it over, sometimes bribing it to go away, often using the press as his bully pulpit. At some point, Moses had amassed an enormous political base and challenged outwardly both the governance of Governor Lehman and Mayor LaGuardia. One of the few local victories against him was when he threatened to annihilate the bulk of Brooklyn Heights for his new road system leading to the Battery Tunnel. The prominent and wealthy people of the Heights organized against him, finally beating him back, forcing the highway to run underneath a new promenade, which today is a hallmark of the borough. No such luck, however, was available to the communities of the Bronx when he all but scorched the fabric of the Borough with the construction of the Cross Bronx Expressway. Nor did Windsor Terrace fair well, being ripped in half by the Prospect Expressway. In the ultimate irony, he was bigoted against any kind of railway service. Plans to add rail service over the Verrazzano bridge was scraped, leaving Staten Island without a significant rail link until this day. Airport rail services were dismissed. While the inner city communities where demolished, scared and run over, Moses promoted the likes of Jones Beach and the new Eden of Long Island suburbia, while city mass transit was slowly squeezed until the mid-1970's when usage and service cuts brought the system to its bare bones. The 2nd avenue subway was scrapped, and the collective memory of the abuse by Robert Moses lead to New Yorks being still skittish and reactionary in response to any development. Moses threatened the bulk of lower Manhattan and downtown Brooklyn with demolishion. In midst of the Depression, Moses was awash with money from the tolls on the Triborough Bridge. He wanted a bridge instead of a tunnel for the Brooklyn-Battery connection. The bridge required a huge footprint that would go right through the Wall Street area. Everyone knew that a tunnel was the only rational answer. But Moses wasn't giving in. And he would have gotten his way since he controlled the funds, if not for FDR interceding and declaring a bridge would be a security risk, blocking the Brooklyn Navel Yard if it was bombed. Moses had raw power with the tolls funding. Out of spite he tried to raze Castle Clinton in the Battery, one of the country's most significant historical monuments. The Feds saved it by taking it over, twice needing to intervene in order to prevent Moses from razing most of lower Manhattan and downtown Brooklyn. LaGuardia was a powerful Mayor. Those that followed him, Vincent R. Impellitteri, and William O'Dwyer, were mere twigs to the Moses hurricane. Moses manages to dismiss the NYC zoning commission, ending the Comprehensive Zoning Plan, took over the department of housing and interceded himself between New York City and the power and deep pockets in Washington, D.C. He helped drive the Dodgers to Los Angeles, built Lincoln Center, planed what would be Shea Stadium, and built the fair grounds for the two Worlds Fairs in Flushing Meadows, the 1964 version being boycotted by the Bureau of International Expositions which was in charge of World Fairs, and losing a ton of money in the process. It wasn't until Mayor Lindsey and Governor Rockefeller finally teamed up to remove Moses from power, nearly 30 years later, that things finally ended for the toll driven fiefdom of Robert Moses. Lindsey had Moses removed as Chief Advocate for NYC infrastructure in Washington. They eyed using the toll money to support a new organization, the MTA. New York has permanent political scars from the Moses experience. Projects that are no brainers and simple to negotiate in cities like Chicago and Houston die in New York in the colossal web of local reviews, political grandstanding, and unhealthy intransigence. It is sad. It took a whopping 14 years after 9-11 to decide that to do with the World Trade Center site, which is still under construction at this late date of July 2017. It wasn't until Robert Moses directly threatened the power and prestige of Mayor Lindsey and the Governor, that finally anything was done to curb Moses. He was far better funded than either politician and it took a full court press to finally get Moses to succumb. And when the dust settled, the State gave the entire financial empire of the Moses machine, the tolls from all across the city of New York, and handed it, lock stock and barrel to the newly formed Metropolitan Transit Authority. Along with a commuter tax, and surcharges to regional telephone service, and additional revenues from the gasoline tax, the MTA should be as well funded as nearly any institution in Western Civilization that is not the US Military. And in fact, today the MTA has more funding than at any time in its history. So you would think it would be able to manage, and yet somehow the MTA seems to always come up short. On the surface, it would seem that it would take massive incompetency to take the economic engine of the Roberts Moses machine, and bankrupt it. It just defies common sense that it would be possible. And yet, this is exactly what the MTA claims to have happened under their watch. We went from graffiti filled, urine odored trains, stations and depots before Hugh Cary, followed by Rudy Guilliani and Pataki finally stepped in with a massive infusion of capital and debt that financed the rebuilding of hundreds of stations. and purchased 100's of air conditioned subway cars, to being 40 billion in debt and unable to keep simple switches working. Early reconstruction, in the 1980's was carefully debated and analyzed, the public agreed to allow the MTA borrow money and roll out the reconstruction of stations up and down the system from Times Square to Stillwell Avenue. And yet, the question has to be asked, why was it needed to borrow to do this basic maintenance? agency to issue bonds for new debt on top of that. When the second round of building made it's way, the public got pretty hip to the scam the MTA was putting over on us. Alan Hevesi accused them of running two sets of books and a new capital borrowing was soundly defeated at the polls. Much of us thought that finally we would see sensible funding applied to the MTA. We forgot the lessons of Boss Moses. Little did we know that the MTA's shell games was just beginning, and that planners for the system had on the drawing board billions of dollars of expansions, and supposed improvements that would get shunted to the capital budget as debt, only to return to the riders a few years up the road as fares and tolls increased. We never dreamed that in addition to the massive waste, that these idiots that ran the MTA would also bring the system to its knees with derailments, service outages, with passenger safety being put at risk, and a rampant rat infestation and stations turned into homelessness shelters. The MTA has all but declared war on the riding public, and in doing so has drawn a dagger right to the heart of the city's vitality and economic development. Let's look, for example, at the case of Macy's and Herald Square. As one of the crown jewels of New York City's corporate citizenry and symbol of so much of our legacy. Tourists and locals flock to their central store to spend afternoons, shopping and dining in an organization that truly understands customer service and communal participation. From the Thanksgiving Day Parade, to the fireworks on the 4th of July, Macy's has packed in crowds for generations. People come from all around the city to attend Macy's events and shop at the flagship store. They pour in through the Herald Square subway station, the PATH Train and the LIRR, and during the Christmas season it is nearly a crush to navigate all seven stories of the store. Packed with Macy's shopping bags, seen all about Broadway, everything stops when one reenters the 34th street train station. Aside from being unbearably hot, with air so thick that is makes it hard to breath, the station stinks not only from urine, but also from the over 20 permanently settled homeless people who threaten passengers, take over all the benches, fill the trash cans up with boxes of rotting garbage and turn the 6th Avenue line into a shany town. Macy's customers pack onto filthy trains with vomit and garbage in cars occupied by even more homeless. Few places in the city stand in starker contrast. How can the city be allowed to treat a model citizen such and RH Macy's so abusively to make its primary transit access a rat infested 3rd world slum? Welcome to Macy's, and Welcome to New York City. By the time the press finally got a handle of this ghastly situation, the Mayor and the Governor kicked back and forth responsibility for the current crises. It is a circus that is not worth repeating here. Find it in the NY Post and the Daily News. The MTA itself has apologized and gave a perfectly plausible sounding explanation and plan for a fix of the situation. And this is where New Yorkers need listen to what is being said by the MTA very carefully, and to understand what is the meaning of what they are say. The MTA said that it has misused its capital budget for big ticket items instead of having an accelerated track signal replacement program. And furthermore, they are blaming underfunding, particularly the failure to toll the Brooklyn Bridge, as a reason for funding shortcomings. Really, Robert Moses could steam over all of NYC's government, threaten Washington DC, build the worlds longest suspension bridge, and turn New York State into his private fiefdom with the earnings from the tolls that the MTA now possesses, but this leadership, and its band of experts and press followers can't get so much as the B trains switches to work during rush hour and reliably move a train from W4th Street to Broadway Lafayette. We are hearing echos that they need congestion pricing on the East River Bridges. 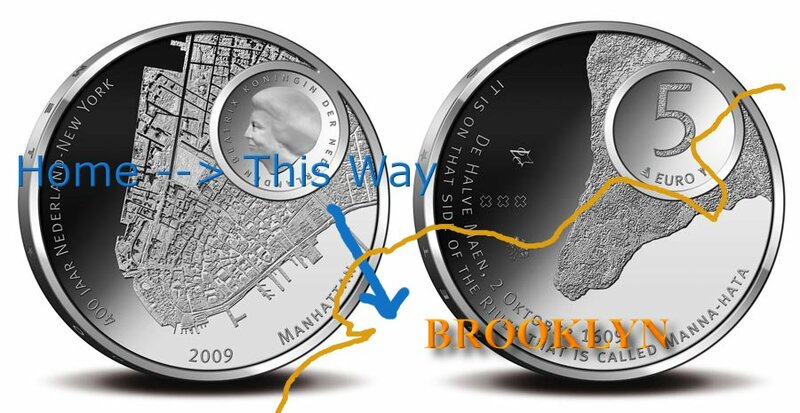 It kills the MTA that anyone can move from Brooklyn to Manhattan without them getting a cut. It is a nightmare, and we have to end it. Not only does the MTA have the largest funding it has ever had, and its funding outside of dept-services has beaten inflation by 50%. In total it is up to 15.7 billion dollars in revenue, and only 8 percent of that is from Moses Tolls and transportation fares. Something is seriously wrong and feeding this monster is not the answer. What we need to do is hold it accountable. It is time to dismantle the MTA. Hand the NY Transit back to NYC along with the tolled roads, and hand the LIRR and Metro North back to NY State and let Nassau and Westchester grapple with it. It's been said from upstate politicians that they don't want to pay MTA taxes since it helps NYC more than Orange County. That is a falsehood, with a touch of maliciousness towards the city added in. If they don't need the MTA, there is no reason for NYC to pay for MetroNorth. If MetroNorth, and New Jersey, and Long Island things its growth is not tied to the transportation grid that connects it to NYC, I'm willing to run that experiment. What I am not willing to do is to continue with a public cooperation which is not accountable to anyone. The MTA has huge pockets when it comes to spending our money. 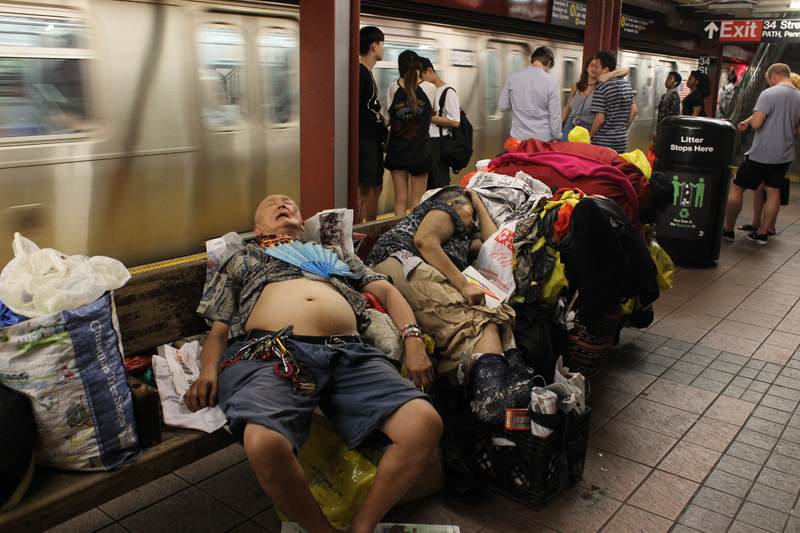 They have WIFI in subway stations now so the homeless can feel more connected, signalling systems that know the absolute location of every train as they sit between stations in lower Manhattan for an hour at a time. We have endless countdown clocks and smartphone aps to tell us where every bus is, instead of just giving us that we want which is swift and regular buses, and dependable and fast trains. The MTA has built and entire new floor to Grand Central Station, which was under capacity to begin with, so that LIRR riders don't need to take the subway across town. It would have been cheaper to make that a free transfer from Atlantic Avenue. It buys million dollar buses that can't handle passenger service, but are state of the art eclectic buses. We have more signage telling us how to behave than signage to tell us what train we are on. It never ends. The system that had virtually no capital debt in 1980, today struggles with $40,000,000,000 in capital debt. That is $5000 for every man, woman and child in New York City. That is 2.5 billion in debt service a year. That is 2.5 billion in debt service a year. signals, work has been completed on just one line. half a century and cost $20 billion. We obviously can not continue like this. While the press and the MTA keeps blaming its troubles on an "ancient" infrastructure, particularly switches, the truth is that the system in 1940 had almost twice the number of rides, and a particularly intense rush hour in the days when Wall Street was filled with brokers, secretaries, feeders, and dozens of other category of workers that have been put out of the workforce by the digital era. And yet they can't fix and replace a 19th century piece of technology like a simple switch... you know a switch is a switch.... exactly like the light switch in the bathroom. We have to ask what are they building and why are they do it? There is no excuse for this. This is a direct result of a Mayor who just doesn't give a damn about working New Yorkers who are struggling to raise families in the York City. His attitude towards us is disgraceful. 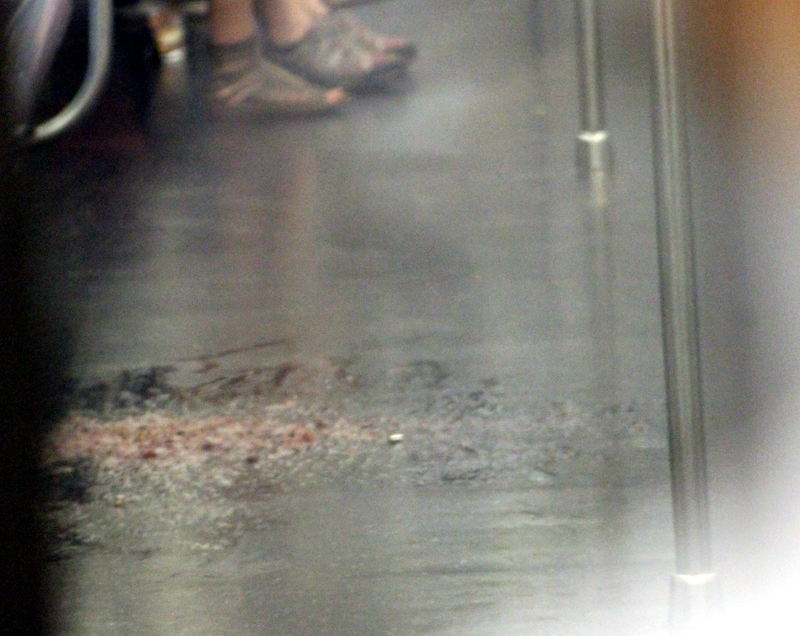 It is almost as bad as this vomit in a subway car I photographed here. Here is a typical Mayoral attitude towards our suffering. Faced with a systemwide breakdown and an MTA leadership which just continually soaks up more and more money, this Mayor is not even aware of what the voters suffer, let alone can properly advocate for cost containment in a rational manner, let alone normal police protection within the tunnels and platforms of the subway. He is a bad man, and has to go if we are to get anywhere with the highly corrupt selffunding MTA.